The idea: Instead of flat 24x24 modules, build simple 5-sided boxes so that the main playing surface is elevated. This gives you the freedom to go both above 'grade' and below. 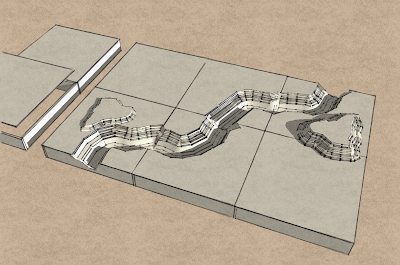 Also, while I like the idea of modular hills, I don't think I'll include them in the table tiles. Done separately from the table, the hills would be more flexible and could hide the table joints/measuring aides. See part 2 of this modular table idea here. See how to make the buildings here. This looks like the tile game Carcassonne. And cool. Another way to hide joints would be to have irregular shaped "patches" to lay ontop of your boxes. Basically a colored, opaque, clothlike material with virtually no thickness and maybe texture(sprigs of grass,flocking, etc.) added. Obvious a few of these, in addition to disrupting guessing aides, could create the vibe of the tundra, savannah, lava bed, and so on. OMG - that is a great, great idea! You can set up the boxes to store the pieces, yes? I mean the ones that aren't ravines and trenches. We are so building this. We can showcase it on the new website I'm building. Oh yeah, Matt, once again my thinking had become very uptight, man. That would be a good idea to work in some random rubble, not necessarily difficult terrain, just a little texture. And I really like the idea of using those pieces to push the table one way or another...like you said, the same table tiles could look like a jungle or a barren, rocky wasteland. Thanks Brent, obviously I can't take credit for the idea, as I'm sure I've seen similar tables on other sites. I do, however, have the software to present it in a different way. 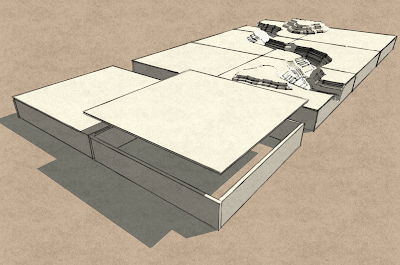 Yeah, I'm thinking that since the playing surface will be flat, each 'tile-box' could be stacked, with the voids housing and protecting other pieces, especially fragile pieces like trees or anything made of foam. Exciting news about the website, feel free to pass along anything worth passing. Also, a 2'x2' module isn't bad--that's the same size that the GW table is. 1'x1' would be a bit too flexible and easy to guess ranges. Gauthic, if you've got Lightwave, we should shoot some stills of our models and animate a battle report--no more pesky crotch shots! Haha, no need for shame, Jeff. Once you find out how easy the software makes things, you'll see that I didn't do much. It's just Google SketchUp, and yeah Matt, it's free. While there is a Pro version, the free version is capable of producing what I'm showing here. It's great software...robust, intuitive, lot of options, lot's of support, shared content, free plugins (and free is nice too). It's a nice way to quickly build something virtually, and also produce an appealing rendering. 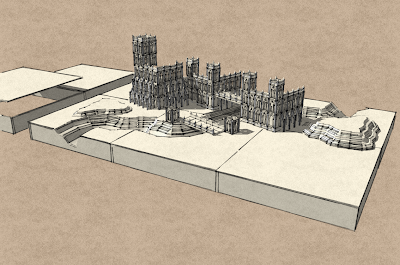 I've not messed with Sketchup at all--although from what I've read it's VERY nice at building structures (much quicker/easier than a GP modeler, such as Lightwave). I might DL it and fiddle with it. You know what? I keep looking at this last picture--I really wanna play on that table! I was thinking we could use magnets to make sure they hold together. When are we going to start on this guys? PS Simon, did you beat ol'Dale? I’m cool with starting whenever. Well, I guess starting in January is the earliest feasible time. I have some ideas about joining the tiles I didn’t get into last post…maybe I’ll cook up another post to illustrate. Hopefully, I’ll be able to get my table saw out of the crate and set up soon. That will greatly increase the speed and precision of the project. I got the Ork goodies from Dale, many thanks. Cool stuff and very useful. Unfortunately, I did not beat Dale. I think even he would agree that had I not made so many rookie mistakes, it might have had a different outcome. It was so bad that he had to ask on more than one occasion “Why did you do that?” I would then have to admit that I wasn’t sure why I had done it (maybe there’s an article idea for you: always have a reason). My mistakes ranged from objective placement all the way to forgetting to utilize Mob Rule and Waaagh! I’m in danger of having my Warboss status removed. I'm a single on the herbalife distributor in the North west, what initially labored for me before turning out to be a distributor was, 2 shakes each day of Formula one and Formulation 2 which can be in tablets kind x three times every day. I used to be recommended to consume at least 3 litres of drinking water. I blended my Method 1 shakes with Soya milk, 250mls 2 occasions per day. I had to have one overall health meal a day. in in between, I took herbalife protein bar, and a few soya nuts snacks. (study the previous posts above). I took Prozac and it created me lose wight. everyday temptations to overeat or eat the incorrect things. feel a bit numb .When I am on it , it's tough to really feel pure pleasure .Aside from that , it makes me general a much better person . strawberries & lemons are very acidic. they take the enamel off of your teeth. i don't recomend that even if it does perform. for specific reasons. I appreciate you pointing that out. I am producing sufficient progress without that proper now.